I’m referring to firm lentils, like beluga or du Puy. Brown lentils are too mushy for this, and red lentils are right out. Save those for soup. Lentils aren’t really a thing people get excited about, so I know you’re dismissing my advice right about now. It’s okay. I mean, if that’s how you want to live your life. But lentils are kitchen heroes. They can be a side dish. They can be the main event. Hell, put ’em in a food processor with a can of chickpeas and some tahini (and whatever else). Lentil hummus! You can have that idea. That one’s free. Aside from being cheap, lentils are ridiculously easy to make. Can you make pasta? 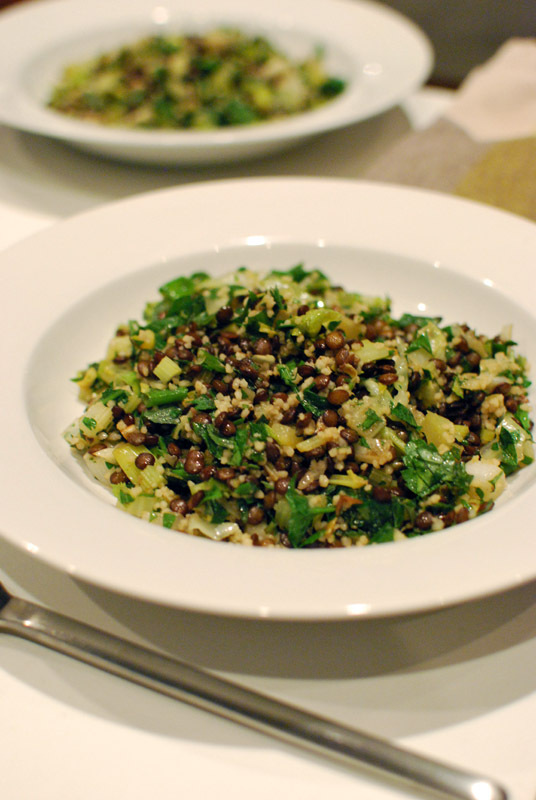 You can make lentils. Same process, but about 18-25 minutes cook time, depending on how fresh they are. Make a big ol’ batch. It’ll take about 10 active minutes of your life, including the washing up. If you have cooked lentils in the fridge (or freezer), you’re never at a loss for a fast, healthy meal. They’re not leftovers. They’re an ingredient. They’re an ingredient you were smart enough to make in advance. Look at you being all smart. That’s nice. But y’all just want the trick to Awesome Lentils. The trick to Awesome Lentils is to toss them with some sort of dressing while they’re still hot. They soak it up like sponges. They turn awesome. A basic dressing would involve a clove of garlic microplaned into a big bowl, a healthy pour of olive oil, and half a lemon squeezed in. Salt and pepper. Add hot lentils. Stir. Profit. If you want to get fancy (you do), add a ground spice. Cumin goes with damn near anything. Mustard is zesty. 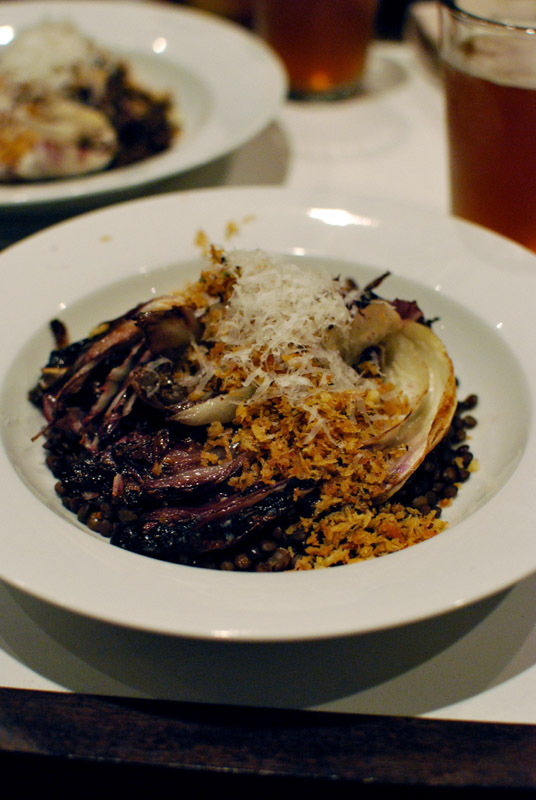 Allspice is okay if you’re serving the lentils with pork, but probably no other time. Don’t be afraid to get intense with the flavors; lentils can handle it. That’s the basic plan. From there, you are only limited by however boring your imagination is. 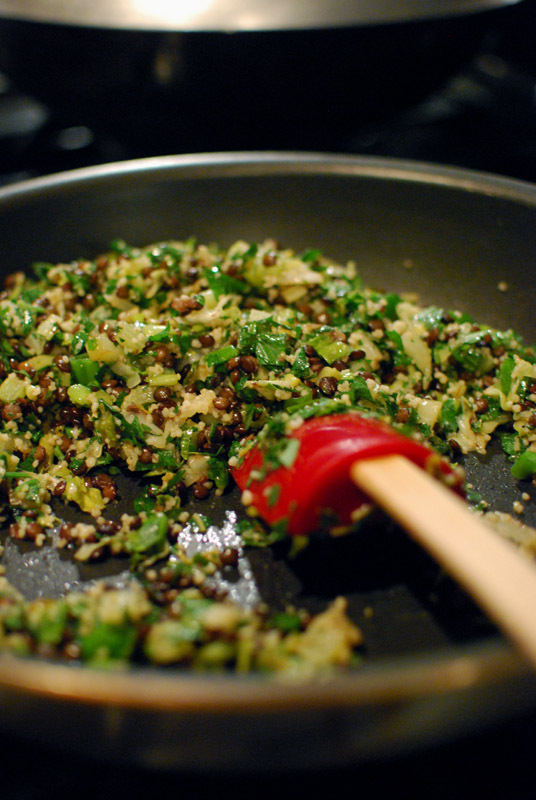 If you’re serving them as a side dish, you can add some sautéed onion and chopped parsley. If you want to practice your knife skills, cut some mirepoix into fine dice, sauté it in butter, and toss some lentils in at the last minute. Serve next to your favorite roasted chicken part, or whatever. If you’re serving them as an entrée, make it a salad. Add chopped vegetables and a ton of herbs, maybe some cheese, maybe some chopped-up meat. 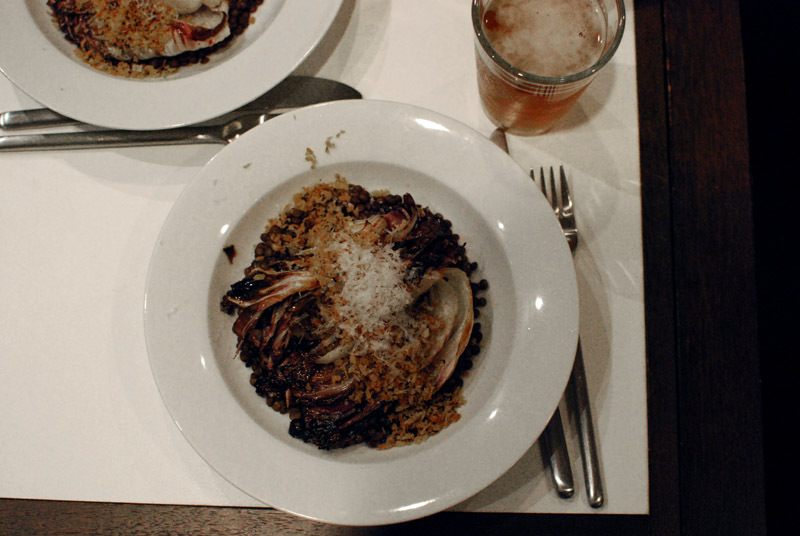 Serve over quinoa or rice, or don’t. Put a fried egg on ’em. 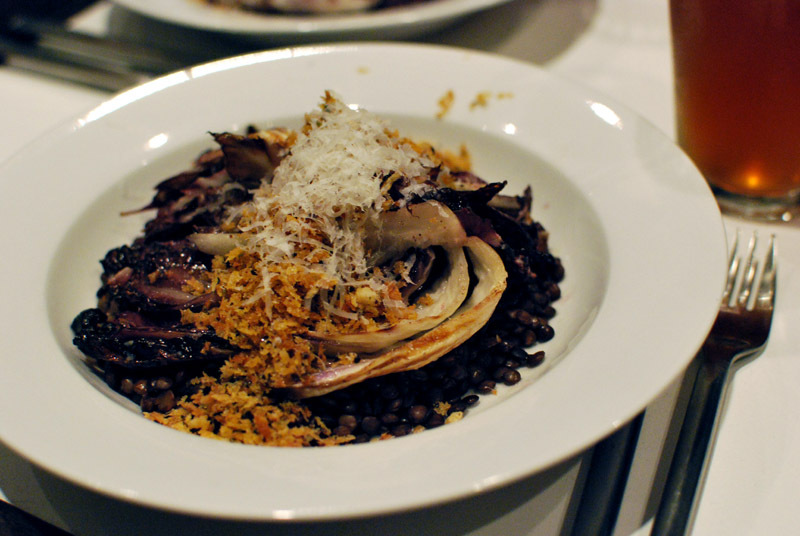 Here, I’ve served one of my all-time favorite salads on top of some Awesome Lentils: Molly Wizenberg’s Roasted Radicchio with Anchovy Vinaigrette and Preserved Lemon. It’s like a really sophisticated warm Caesar salad. 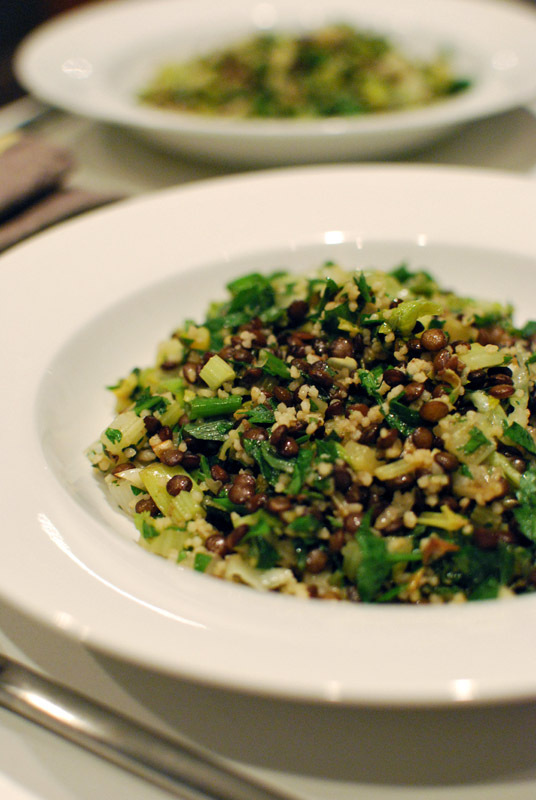 That vinaigrette is ridiculous (and was used to make those particular Awesome Lentils). The other dish pictured is a house specialty called Leftover Surprise. It’s all the compatible leftovers heated up in a pan together. This one involved Awesome Lentils, brown rice, couscous, celery, green onions, parsley, and a quick tahini-lemon sauce (meaning I poured some tahini in the pan and squeezed some lemon juice in). Okay guys if I’m honest, I don’t always have cooked lentils in my fridge. I should. When I don’t, come dinner time, I often find myself standing in front of the fridge wondering what the hell I can cobble together out of whatever’s in there. This is never the case when Awesome Lentils are on the scene. You’ve been advised. 1 pound of lentils is about 2 cups, and will make 4-6 main servings, or maybe 8 side dish servings. This, of course, all depends on what you do with them. This recipe will work no matter how many lentils you have. When making lentils, I don't measure anything, mostly because I get lentils from the bulk bins at a Certain Upscale Grocery Store (it is Whole Foods). Sometimes I get fancy and add some chicken stock to the cooking liquid. I always add a bay leaf or two, but it's not mandatory. The dressing is important, but it doesn't particularly matter what goes in it. The simplest thing is plain ol' olive oil and lemon juice (emulsification is not necessary). Microplaned or pressed garlic cloves are excellent here. Get fancy, or keep it simple. Please do not use a purchased salad dressing, unless you think it is the most incredible salad dressing you've ever had and probably god made it and also it cures cancer. 1. Rinse the lentils, and check for any stones. It can happen! 2. Put the lentils in a pot, and add enough water to cover by two inches. Add salt, about 1 teaspoon for every cup of lentils, and bay leaf, if using. Bring to a boil over high heat. 3. When the liquid boils, set a timer for 18 minutes. Lower the heat to medium-low, or however low it takes to maintain a brisk simmer. 4. While the lentils cook, get out a large bowl. Make the dressing in this bowl. 5. When the timer goes off, taste to see how done the lentils are. If they need more time, give them 3 to 5 more minutes. 6. Remove the cooked lentils from the heat. Drain well, and immediately dump them into the bowl with the dressing. Toss, and let stand for a few minutes to soak up all the lovely dressing. Eat as is, or jazz them up in one of a million different ways. Awesome!